I also needed more information on the quantities of coconut and nuts in the filling. By Googling “apricot strudel,” I did find a Cooks.com recipe, which is very similar to Jessie’s, though using dried apricots soaked overnight, instead of jam. I chose to do this adaptation, as I always have dried apricots to make my version of Ina Garten’s World’s Best Granola. I definitely did not want to run out to one of our island’s three modest food stores for store-bought jam of questionable quality (you pays your money and you takes your chance – as the expression goes – when you need something in a pinch on this small island!). Getting back to not reading recipes closely, I initially forgot to add the coconut to the filling until after I had just put the cookies in the oven. I had a bag of “fancy sweetened flake” coconut set right out on my work area, so I just was not paying attention. I also cut the rolled dough into one-inch slices before they went into the oven. According to Jessie and Cooks.com, the log is to be baked intact, sliced afterward (my directions are for pre-slicing, but you could bake the logs intact for an extra five minutes, I imagine, for a more finished looking pinwheel). So I decided to throw the coconut on top of some of the slices. I baked two of the four pieces of dough, freezing the other two and refrigerating the filling – with ½ cup coconut incorporated now – for a few days later). The cookies turned out well, with the lightly browned coconut-strewn tops. A sour cream-butter dough generally yields a tender, rich, flavour-packed pastry – and this is exactly the case here. I found the apricots to provide a chewy fruitiness – rather than a jammy sweetness – to the filling. I was happy that I deviated a bit from Jessie’s directions. This is not a very sweet pastry, however. Nonetheless, I think this “apricot strudel” is a sophisticated Old World classic, perfect for café mit schlag. 1. In a stand mixer, with the paddle attachment, mix the butter with the sour cream, until blended. Add flour and sugar on low until just blended. Form gently into a ball and wrap in plastic wrap tightly. Chill in the refrigerator overnight. 2. Soak the dried apricots overnight in enough water to cover along with cloves and cinnamon. 3. The next day, when ready to bake, pre-heat oven to 375 degrees. 4. Drain the apricots and put through a food mill or chop very finely. 5. Add sugar, coconut, and nuts. Mix well. 6. Divide the dough into four equal pieces (when weighed, each is approximately 6.2 ounces). 7. Roll out the chilled dough 1/8″ thick into a rectangular shape, approximately 10” by 6”, on a floured surface. Spread one-fourth of the filling over all the dough (one fourth of the filling should weigh about 12.2 ounces) and roll up like a jelly roll, starting on the longer (10”) side towards the opposite longer side. 8. Slice into 10 one-inch thick slices. 9. Place slices, two inches apart, on a silicon non-stick mat or parchment paper, on a baking sheet. 10. Bake in at 375 degrees for 10 minutes. 11. Reduce heat to 350 degree, and bake for an additional 30 minutes or until golden brown. 12. Cool on wire racks. 13. 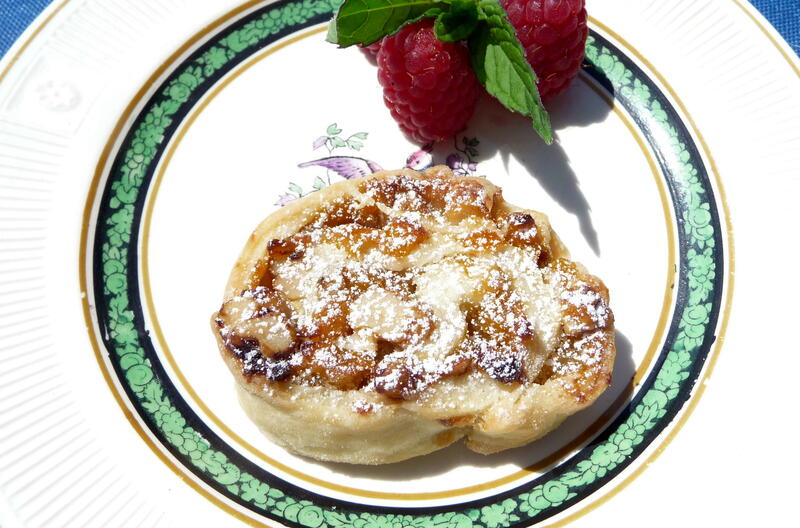 Sprinkle with confectioners’ sugar and serve…maybe with cafe mit schlag? 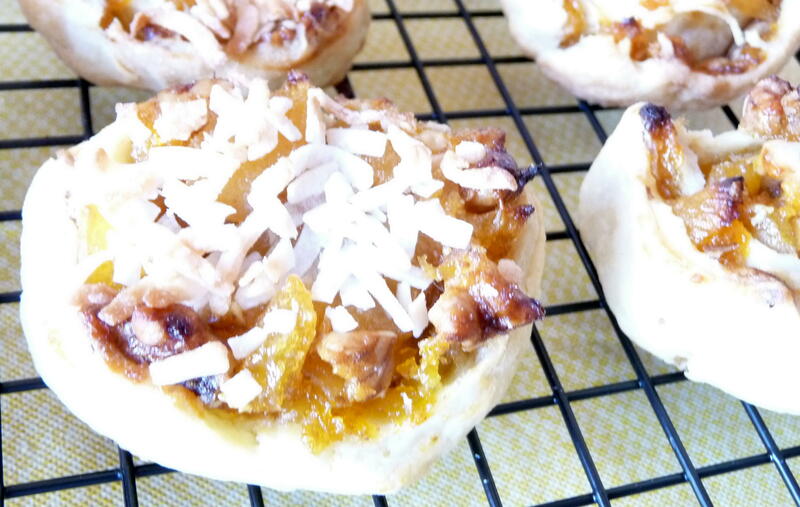 This entry was posted in Baking, Cookies, Dessert, Recipes Misc, What Would Jessie Dish and tagged apricot, cookies, Island life, Old-Fashioned Cuisine, rugelach, Strudel, Vintage Recipes. Bookmark the permalink. I am jealous you had homemade apricot butter on hand. Where do you get most of your groceries if not from the small, pay and take your chances places? Geni, the apricot butter was probably the most time-consuming thing I’ve canned, with a small yield – but really good. Many people do major supermarket shopping in Victoria or even Vancouver once or twice a month; one of our stores has organic, imported, and specialty foods but higher prices (I think the Sriracha sauce I bought last week near Vancouver was about half the cost). The selection here is a bit better than I implied. 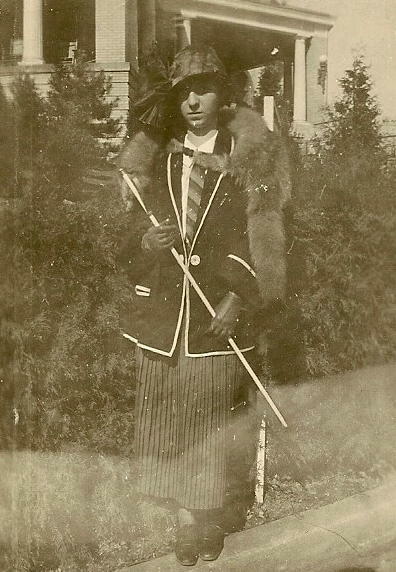 I LOVE all the old photos of your grandmother–And random aside, I’ve been to the resort in French Lick, Indiana! Hi Dan, indeed, I could sit and look through old photo albums for days at a time. I love glimpses into people’s lives, and seeing snapshots of moments in time. French Lick was interesting…I’d never even heard of it, but I spent a long weekend there with my best friend at the time & her parents. If memory serves, a lot of it seemed kind of old & run-down (I understand they’ve renovated & remodeled), but the grounds were nice! Looks like a great recipe. I love the old pictures too. 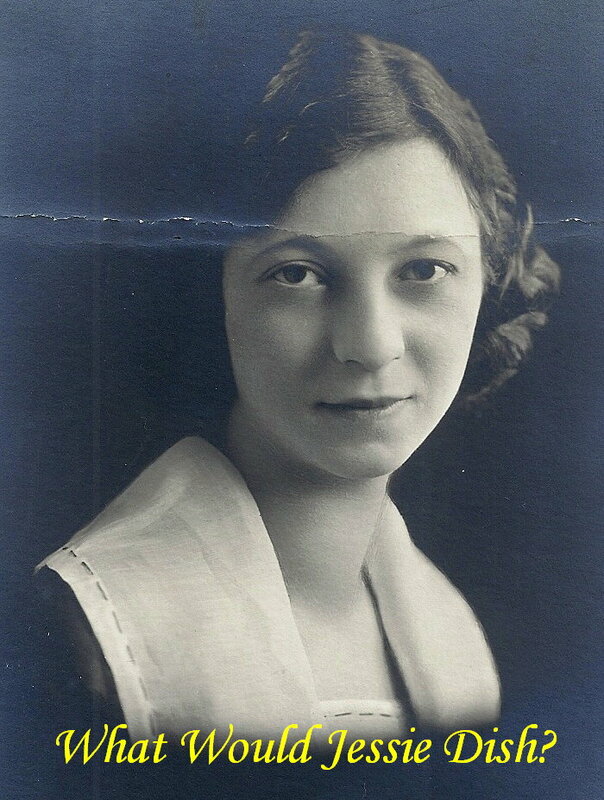 I need to find some pictures of my relatives that have passed on recipes to our family. It’s intriguing to attach a face to the original author. I think it opens the imagination. Jessie was such a classy lady, eh Dan? This apricot strudel-rugelach is pretty simple to make too, I imagine! Yes, Jax, Jessie had a great sense of style and was quite the shopper. I think Jessie probably would have gotten a kick out of my re-creating her recipes, though she’d have scoffed at my dried apricot step in the strudel-rugelach (it’s far easier to use ready-made jam, which was very clear in her version). I love all the old photos, I haven’t had breakfast and your post is making my stomach growl. I’ve been wanting to use apricots, I bet they would be awesome like this! You’re also totally right about pastry dough with sour cream — amazing and flaky. I thought it was some weird Russian thing when I first made a batch of pirozkhi, but glad to know it’s a more widespread technique! Thanks for your sweet comments, Maddie. I agree about canning – it can take time but is worth it, especially with foraged items (free! ), such as wild blackberries that grow here. Last year, I canned chutneys, mulled vinegar, jam, jelly, preserves, and sauce from blackberries. I think that many European cuisines have baked goods with sour cream, cream cheese, yogurt, buttermilk, or sour milk. This acidic reaction creates the tender, tender crumb! Had the strudel you made, with coffee (no whipping cream), did boil the milk – Indian style. I quite liked the strudel, a little tartness, which I liked. From reading your recipe, would that be the sour cream? I know, you must wonder, will she ever bake? No, just eat your wonderful stuff! That is one big fox stole on Jessie. Those were the days. Thanks, Kip. I’m glad you enjoyed the strudel-rugelach. The tanginess comes more from the apricot filling which has very little sugar, so the apricot-orange zest really come through. Maybe we should look for a fox stole for you! Hi, Michael. Thanks very much for your comment and for letting me know. I found the dough to be soft, even a bit hard to handle (very delicate), but mine spread out somewhat. My second attempt at baking the entire log-roll first, then slicing, was easier and faster, though the top was not as well-browned. I’d suggest baking the whole log-roll first. Then you can slice it after it’s cooled for better results. Do let me know how it turns out. 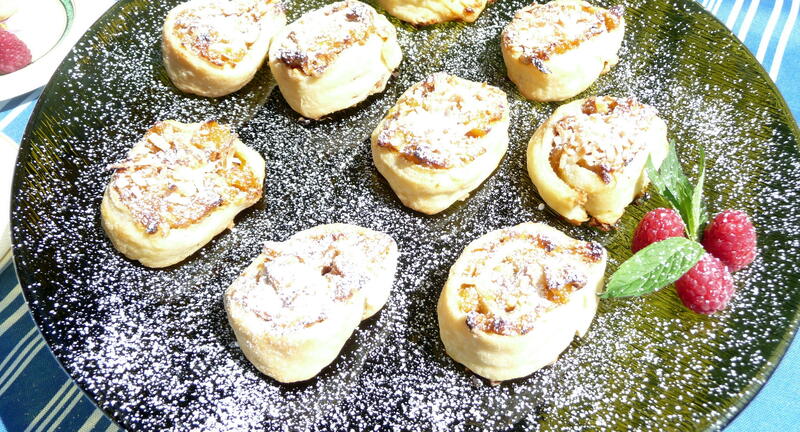 Wow, thank you for sharing Grandmother Jessie’s recipe for strudel and her photos too. I had my honeymoon at French Lick in 1983! Looking forward to trying this recipe in advance of Christmas. I make a German Buffett celebrate my heritage, even though I missed the traditional meals as a child (no grandparents). 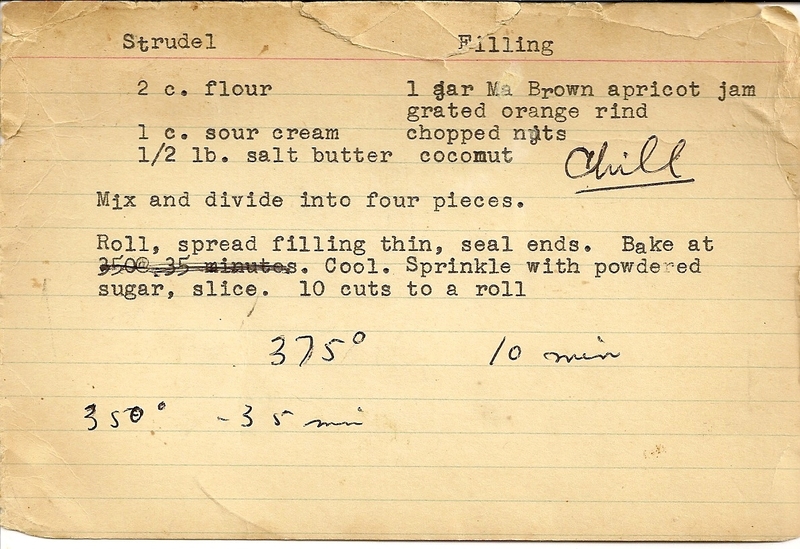 My aunt and grandmother made an apricot strudel recipe very similar to the recipe you present here. The cooking time is longer; I shall try the times written on your recipe card next time as I think they will work better, mine always comes out too brown. 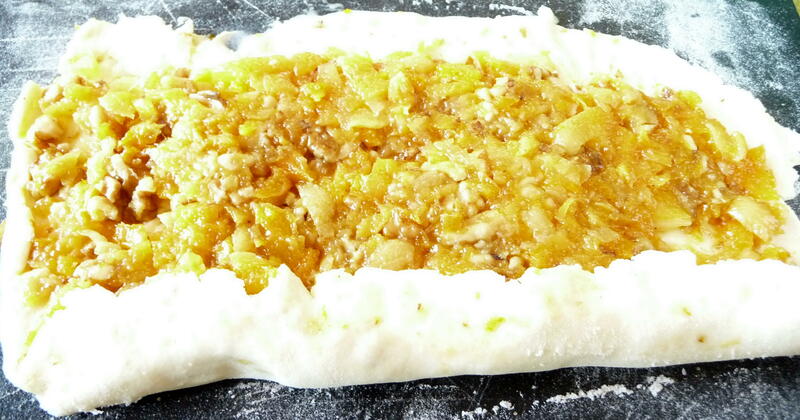 The recipe calls for 1/4 cup each apricot jam, chopped coconut, and chopped nuts (usually pecans) for each of the four large pieces of strudel. The method for preparing is different though — instead of rolling up each of the four pieces, each one is folded toward the middle from the long ends, then the two ends sealed. Each is a large rectangle that is then cut crosswise into several narrow pieces.